Run Time:165 Min Rated:PG (Canada), R (MPAA) for language including sexual references, and for teen drug and alcohol use. 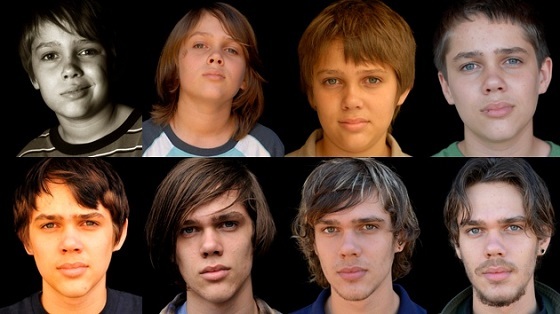 Boyhood is a unique film shot over 12 years that tells the story of a young boy, Mason (Ellar Coltrane), and his family as he grows from boyhood through adolescence into early adulthood. Coltrane plays Mason throughout the film allowing the audience to watch him mature from being a kid in grade school to a college freshman. Through those years his single mother, (Patricia Arquette), moves Mason and his sister, Sam (Lorelei Linklater), to Texas to improve the family’s prospects. Along the way the children regularly spend time with their father (Ethan Hawke) and deal with a series of other people who drift in and out of their family as a result of their biological parents’ various marriages and relationships. At times gritty and painfully honest, Boyhood paints a picture of a family travelling through life always caught up in the moment and struggling to make the best of those moments. These moments are charged with drama, awkwardness, feelings of belonging and alienation, love and suffering. The beauty of the film is not just seeing the character of Mason age but also watching all the other characters age, and to a certain extent watching North American culture age. The whole process of making the film, which is essentially a series of chronological short films, sparkles on screen because it is so patient and deliberate. There are no flash backs or flash forwards, no special makeup to make anyone look older or younger, no changing of actors because a six-year-old can't play an 18- year-old. Time simply unfolds in a natural way and "time" itself becomes a character in the film, and as such has a different relationship with each character. In the 1960s a documentary film movement dubbed Direct Cinema emerged. This style of filmmaking was concerned with capturing reality and endeavouring to portray it truthfully. In Boyhood director Linklater employs an adaptation of this style to great effect. 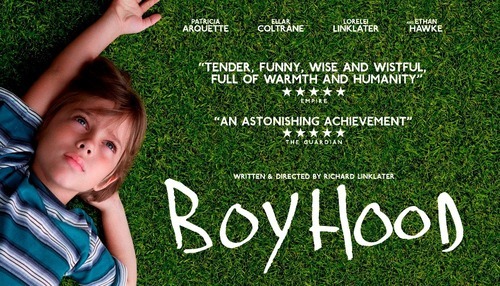 He is concerned with truth and natural dialogue and, while Boyhood is scripted, it often feels like a documentary. The result is a film that provokes introspection. Viewers will see moments that ring true to their own life or they will be confronted with very real looking moments alien to their experience. Either way, Boyhood lingers after the closing credits have rolled demanding refection. When watching BoyhoodChristian viewers might want to consider the way Scripture deals with this kind of reflection on life. Alluding to Isaiah 40:6-8 St. Peter writes “All flesh is like grassand all its glory like the flower of grass. The grass withers, and the flower falls" In Boyhood Mason is shown growing like grass gaining earthly 'glory' while on a parallel track the adults around him, his parents in particular, are withering grass, whose flower is falling. Profound dramatic tension underpins the film when viewed through the lens of Scripture in this way. Time is depicted as unstoppable and the question “What if you aren't seizing the moment in life—what if the moment is seizing you?” comes into sharp focus. The "falling flower" of life touches Mason as he grows like the grass. Early in the film two short, quiet moments illustrate this. One comes in a scene where the family is preparing to move and Mason has the job of painting over any marks inside the house. The camera focuses in on him painting the door-jamb were his mother marked her children's growth. The other comes when Mason as a young boy sits alone and carefully looks at the decomposing carcass of a small bird. Nostalgia runs up against the pragmatic, death runs up against life, and the mediator is the character of time. This would be a profoundly sad film for viewers who have no hope in the face of death. For many people time is a tyrant, but for Christians St. Peter concludes his allusion to Isaiah by proclaiming that "the Word of the Lord remains forever.” Time passes, death comes, but God and His Word endure; the Christian's hope is found in the fact they are wrapped up in Christ Jesus who transcends time and conquers death. Does the enduring "Word of the Lord" make an appearance in Boyhood? On Mason's 15th birthday his father takes him out to the country to meet his stepmother's parents. His new step-grandparents give him birthday gifts: a personalized red-letter edition Bible and a vintage heirloom shotgun. His father and stepmother also give him a suit. All these gifts are presented as items he'd need for his future. There is another scene in this part of the film where Mason and his sister visit their step-grandparent’s church which sparks a discussion about baptism. In depicting this Linklater is relatively kind to the Christian faith avoiding overt editorializing.Rather, his film presents in a plain way a brief moment where a young man who hasn't grown up in the church is fleetingly thrust into a world with which he's unfamiliar. Christian viewers may want to tuck these scenes away in their minds for future reflection as they interact with visitors to their congregation, remembering that they, like Mason, are caught up in the story of their own life with all its ups and downs, questions and concerns. With the summer blockbuster season now officially over Boyhood provides an opportunity to watch something truly memorable—an authentic coming-of-age film that rings true and yearns for something enduring to transcend the fading, withering, falling moments of life. Direct Cinema is related in many ways to Cinéma vérité “truth cinema” a French film movement which also emerged in the 1960s. Historically one of the major differences between these two movements is the use of voice-over 'narration' (Cinéma vérité) or the lack of voice-over 'narration' (Direct Cinema). Isaiah 40:6-8 "A voice says, 'Cry!' And I said, 'What shall I cry?' All flesh is grass, and all its beauty is like the flower of the field. The grass withers, the flower fades when the breath of the LORD blows on it; surely the people are grass. The grass withers, the flower fades, but the word of our God will stand forever."